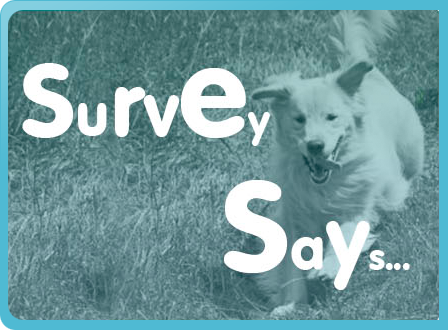 The "Survey Says..." statistics you see on PupQuest's pages come from a survey done by the creators of the site. New dog owners filled out questionnaires when they visited veterinary hospitals, a shelter, or a doggie day care center. With about 80 participants, all located in western Massachusetts, the survey wasn't representative of the country but the results were interesting. They told us that the recent trends we thought were happening amongst our clients, families, and friends were indeed happening. The alarming trend of buying/adopting sight-unseen over the Internet is what prompted us to create PupQuest. People didn't meet their dogs before they committed to buy/adopt them. » Half of the surveyed dog owners never met their dogs before getting them. » Half of the owners didn't personally see the environment their dog came from. The Internet was the most popular way people found their dogs. 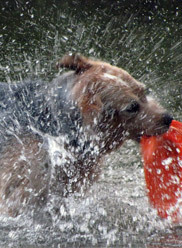 » Over 40% of participants found their dogs over the internet. People got their dogs from long distances away. » More than half of the owners got their dogs from out of state. » 1 in 5 people had their dogs flown to them on airplanes. People thought they were educated about puppy mills, but still bought from them. » Nearly 90% of people said they knew about puppy mills/farms. » ...yet 20% knowingly bought from USDA licensed sources. » Nobody made the connection between USDA licenses and puppy farms. » 57% of buyers didn't know whether or not they bought from a USDA licensed source. 72% of dog owners said they would've used a reference guide on puppy-finding if it was available to them! And most of them said they would want that guide to be a website. We listened. These trends told us an easy-to-use, focused site like PupQuest was really needed!